Two men named Pliny are known to us from their writings, and that sometimes causes confusion. The older man, Gaius Plinius Secundus, is called Pliny the Elder. He wrote a number of books, but the Natural History is the only one that survives. It’s an encyclopedia of what passed for scientific information in that time. Pliny the Elder’s sister, Plinia, married a man named Caecilius, from the northern Italian town of Comum. They had a son, but either Caecilius died when that boy was still young or he and his wife divorced. We simply don’t know. An inscription recording the will of a Caecilius who may have been Pliny’s father mentions a second son. Pliny never refers to any siblings. (The son referred to in the Caecilius document could have been a child by another wife or concubine.) Plinia and her son were taken under Pliny the Elder’s wing. He never married and had no children. When Pliny the Elder died in the eruption of Mt. Vesuvius in 79 A. D., he left a will adopting his nephew, who became Gaius Plinius Caecilius Secundus. It’s not easy to get to know the personalities of people from the ancient world. They did not leave diaries or other personal information. Even someone like Pliny’s friend Tacitus, who wrote a great deal, tells us nothing about himself. Often we can only estimate when a person was born or died. The lack of certainty over Pliny’s biological father and the possibility that Pliny had a brother or half-brother are an example of the large gaps that exist in our knowledge of any individual of that period. What we do know of Pliny is derived from an inscription that records his will and from the collection of letters which he left. The inscription is actually a bit of a problem. Only a portion of it survives. The rest has been reconstructed from a drawing of it made several hundred years ago. There are 247 letters to friends in nine books and another 121 business letters in a tenth book. 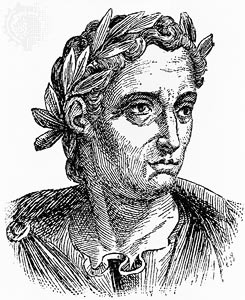 Pliny published the first nine books. The tenth was published after his death. The only other person from antiquity who left us so much information about himself was Cicero, the great orator and writer of the late Roman Republic, who left over 900 letters. Cicero did not get a chance to edit his letters for publication. Pliny’s reputation would be secure if only three of his letters survived. Two of those are the ones he wrote to his friend Tacitus describing the eruption of Mt. Vesuvius in August of 79 A. D. These are the only eyewitness accounts of a natural disaster that we have from antiquity. They show Pliny’s keen scientific eye and his ability to keep his reader on the edge of his seat. His description is so accurate that eruptions of that sort today are called Plinian eruptions. You can read the letters at http://www.u.arizona.edu/~afutrell/404b/web%20rdgs/pliny%20on%20vesuvius.htm. The other letter that guarantees his fame is the letter to Trajan describing Pliny’s dealings with Christians in the province of Bithynia in 112. This is the earliest non-Biblical description of the Christians and their worship services that we have. You can read it at http://www.fordham.edu/halsall/source/pliny1.html.